Home fixing tennis Should the TIU have investigated these seven matches? Should the TIU have investigated these seven matches? Ever since Sunday night, the spectre of match-fixing has been hanging over tennis. This is possibly the sport's darkest days since the now infamous Davydenko v Vassallo Argüello match in Sopot in 2007. This match has been described in detail elsewhere, so it is not something that I will dwell on here. Instead, in this article, I want to focus on three locations - Palermo in Sicily, Sopot in Poland and arguably the most famous location in tennis - Wimbledon. An important thing to bear in mind is that I am not actively accusing any players of fixing. Instead, I wish to present the evidence that is available as a basis for people to draw their own conclusions and for further investigation if necessary. Our story begins on the 27th June 2006 at Wimbledon. In the first round, Italy's Potito Starace is drawn to face Mikhail Youzhny. The Italian had failed to even win a set in his two previous visits to Wimbledon, while the Russian had reached the second week for the third time in five attempts in 2005. When the Betfair markets opened on this match, the prices looked perfectly normal. 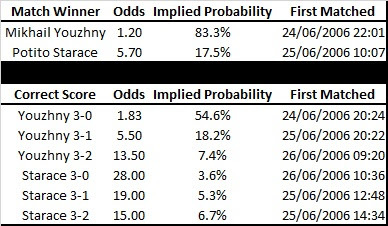 As one would expect, Mikhail Youzhny was a big favourite for the match and the market initially gave him a 54.6% chance of winning the match in straight sets, which is more or less where we would expect to find the market. However, if we look at the last bets matched on these selections before the match starts at 11am on the 27th June, we find a very different story. 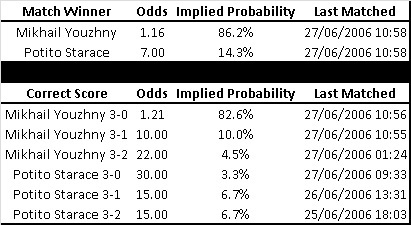 We can see that while the probability of Mikhail Youzhny actually winning the match barely changed, the chances of him winning in straight sets has moved from a 54.6% chance to an 82.6% chance - almost the same probability as his chances of winning the match. 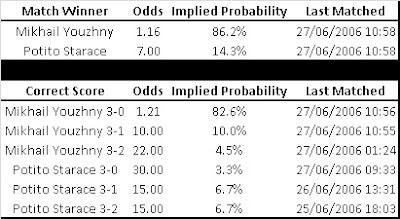 In other words, the betting markets are suggesting that if he wins the match, it is almost guaranteed to be in straight sets. Just to explain what this is showing. 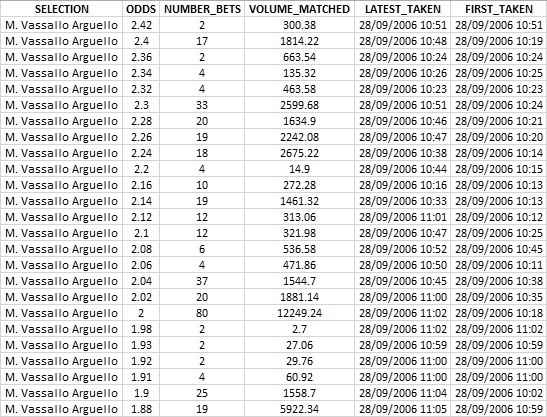 The odds column refers to the odds on the selection (this can be converted to probability by taking the reciprocal), the bets column refers to the number of bets matched at this price, the volume column refers to the amount of money matched at each odds and the last and first taken columns simply refer to what time bets at those odds were first matched and last matched. What we can see here is that from the moment the market opened until four minutes before the match started, there was consistently money flowing into the market happy to back the 3-0 at any odds. In total, there was £290,232.06 matched at all odds between 1.83 and 1.19. Just as a comparison, on all of the other markets and selections combined, there was a grand total of £92,661.52 matched. This is a large amount for a market such as this and appears to be relatively suspicious. Now, this page from the document seems to be referring to the exact match that we are looking at. It shows that there were five linked accounts based in Sicily that were responsible for the vast majority of this move. Coincidence maybe? Possible, but it is the first piece of evidence to remember. The match happened and Mikhail Youzhny won easily in straight sets by a 6-0, 6-4, 6-1 scoreline. The grand total won in the entire market (before commission) on the 3-0 scoreline was £118,822.49. Conveniently, the next stop in our story is the city of Palermo in Sicily, the location of those linked accounts in the previous section. The first round sees Martin Vassallo Argüello drawn to face his compatriot, Juan Pablo Guzman. Vassallo Argüello was the higher ranked of the two players and would be expected to have been the favourite for this match. The Betfair market reflected this with the first odds matched on Juan Pablo Guzman being 2.76, although that was only for £4. The first set of odds with a reasonable amount matched were 2.3 with £173.62 matched. This implied a 43.5% chance of winning the match, which seems reasonable. This was first matched at 21:38 on the evening of 24th September, the day before the match. Twelve hours later at 09:49 on the morning of the match, the price had shortened to 1.50 (66.7% chance) and by 11:32, just less than 45 minutes before the match was scheduled to begin, the price on Guzman had reached an incredible 1.10 (90.9% chance). By the time that the match started, the price had drifted back up to 1.36, which was the last price matched at 12:10, five minutes before the match was due to start. At this point, there had been £204,282.48 matched on Guzman to win the match. Once the match started, there appeared to be nothing overly suspicious going on with the odds. They behaved more or less as you would have expected from the initial 1.36 starting price. For much of the match, it appeared as though Guzman would win, but in the end it was not to be. Curiously, despite the enormous pre-match move, the match was won by Martin Vassallo Argüello, who won it 2-6, 6-3, 7-5. On the face of it, a huge gamble that failed? Maybe suspicious, but maybe not. These passages from the leaked documents are referring to this match and the pre-match price movements. 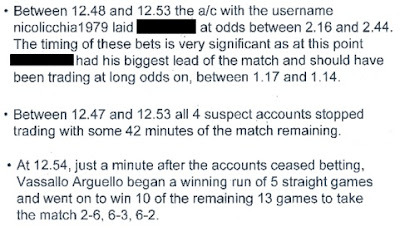 So, we have an Argentinian account that is already being monitored by the Betfair integrity team for suspicious trading causing a huge pre-match move on a match involving two Argentinian players. However, Guzman lost the match, so what was going on here? We remain in Palermo for the second round match between Martin Vassallo Argüello and the Spaniard, Oscar Hernandez. This time, there is nothing obviously noticeable in the betting markets before the match begins. There is just £32,837.76 matched in total before the start of the match and the last price matched on the two players to win are 1.75 on Vassallo Argüello and 2.28 on Oscar Hernandez. Oscar Hernandez raced into a 4-0 lead in the opening set. We would have expected the price on Vassallo Argüello to have drifted to roughly 3.5-4.0 by this point, possibly a fraction shorter if he were playing relatively well, but just not quite getting over the line in games. What we actually find is that the biggest price that he was matched at in the entire match was just 2.42 (41.3% chance). For whatever reason, someone is keeping the price on Vassallo Argüello from drifting too far. The price was backed back into around 2.0 (50.0% chance) by the end of the first set, which is strange given that he was matched at 1.75 just before the start and had even been matched at 1.94 before the match began. 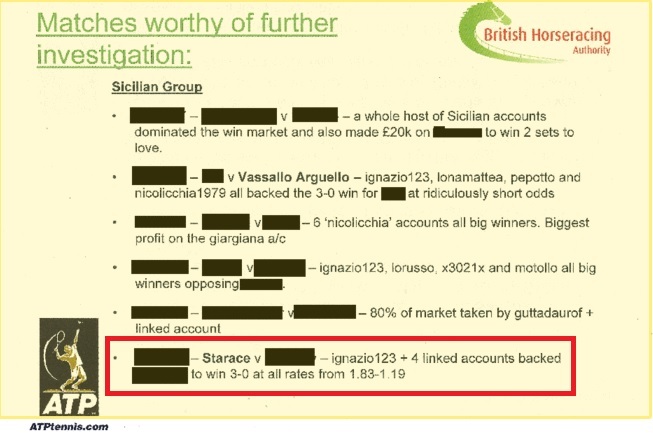 Once again, it is the Sicilian and Argentinian-based accounts that have been responsible for much of the money matched on the market. We can see that having opened at 1.47, the market was fairly aggressively backed right into 1.20 starting from around two hours before the start of the match, scheduled for 10:00, kicking up in the twenty minutes before the start. Again, as with the earlier Starace match, we have a situation where a player is almost the same chance to win 2-0 as he is to win the match. That means that he is basically guaranteed to win 2-0 if he wins, which simply should not be the case in any match. 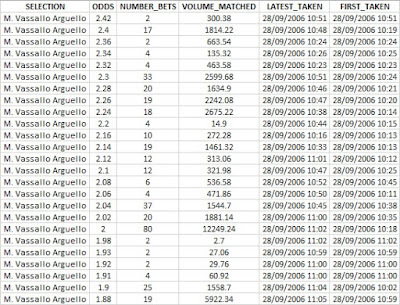 Nicolas Almagro would record a straight-forward 6-2, 6-2 victory and a total of £12,643.88 was won on this market in total. Small change compared to some of the wins on other matches, but a handy sum nevertheless. Suspicious? There are certainly questions that need to be answered. It would have been deemed as suspicious on its own, but combined with the other matches in Palermo that week, it demands a full investigation at the very least. Almost a year to the day after our story began, we returned to the hallowed grass courts of Wimbledon for a first round match between South Korea's Hyung Taik Lee and Argentina's Martin Vassallo Argüello. Neither player had any real history at Wimbledon - Lee had made the second round three times previously, but had never progressed further losing to Federer, Rusedski and Hewitt, although he had taken sets off the latter two. Vassallo Argüello had only appeared at Wimbledon once before, three years previously when he lost in straight sets to Chile's Fernando Gonzalez. This shows that in the two days before the match, the price on Hyung Taik Lee to win 3-0 was backed all the way from 1.88 (53.2%) into an extraordinary 1.08 (92.6%). What makes this price especially bizarre is that it is actually shorter than the price on Lee to win the match itself. To repeat that, the market was suggesting that Lee was more likely to win the match 3-0 than he was to win the match itself. As it were described elsewhere, this is analogous to a football team being more likely to win a match 2-0 than it is to win the match. In every possible way, this makes no sense whatsoever. The Sicilian-based accounts are once again backing a 3-0 scoreline into an absurdly short price, perfectly mimicking what had happened the previous year with Potito Starace. In total, there was £106,120.18 matched on the 3-0 scoreline that paid out a grand total of £46,099.76. Finally our story brings us to arguably the most infamous tournament with regards to fixing allegations in tennis history. However, our first stop is the first round match between Martin Vassallo Argüello and Maximo Gonzalez. Before the match, there was nothing suspicious in the markets. Martin Vassallo Argüello opened at 1.4, drifted out to 1.88 before shortening back into 1.54 with just under £40,000 matched on him. Once the match started, Maximo Gonzalez took an early 4-0 lead, yet the odds on Vassallo Argüello were kept at around the 1.8-1.9 mark. This continued to be the case at 6-2 after Gonzalez closed out the opening set. Maximo Gonzalez went a break up in the second set at 2-0, yet still the odds on Vassallo Argüello refused to move from the 1.8-1.9 band. The following paragraph from the leaked documents explain what happened in a six minute period after Gonzalez took a 2-0 lead in the second set. This is an account that we have seen before during the Vassallo Argüello match at Wimbledon. Again, it could be a coincidence, but it is getting harder and harder to believe the sheer number of coincidences needed. 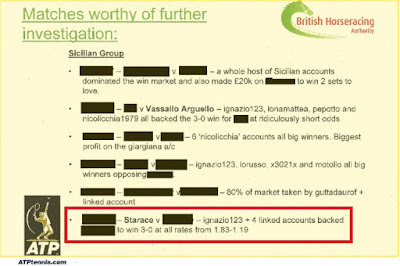 Four linked accounts in Northern Italy won a combined £75,881 on this match. 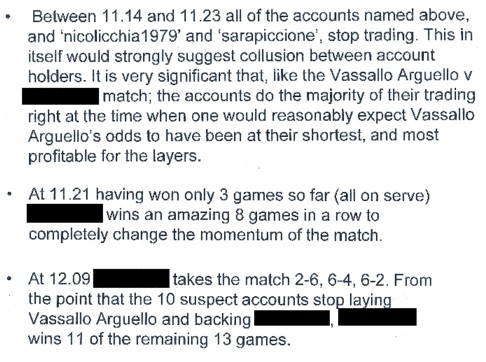 This quarter-final match came less than 24 hours after the most infamous match in fixing history - the Vassllo Argüello against Davydenko match. That match has been covered in great detail elsewhere, not least in the Buzzfeed report, so we shall move on from that. 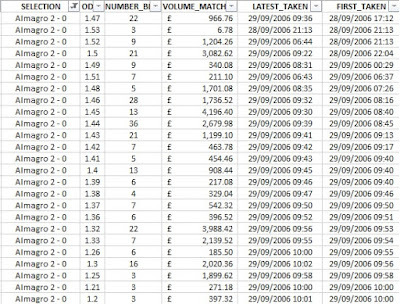 In addition, the Betfair data for that match has been removed, so we cannot follow the odds and money trail ourselves. Instead, we move onto the quarter-final between Martin Vassallo Argüello and Albert Montanes. Once again, the pre-match markets appear perfectly normal. Once the match started, Martin Vassallo Argüello won the opening set 6-2, although the first strange signs were beginning to appear as money was matched on Vassallo Argüello at 2.06, which was a bigger price than he had been at a single break up in the opening set. Yet again, it is the same Northern Italian-based accounts involved as in the first round match against Gonzalez, which also started with a 6-2 set, had a break lead in the second set and lost the match. And again, the account has picked the perfect time to stop trading the market. Either we have found the perfect trader that can judge momentum to absolute perfection or there are questions that need to be asked. 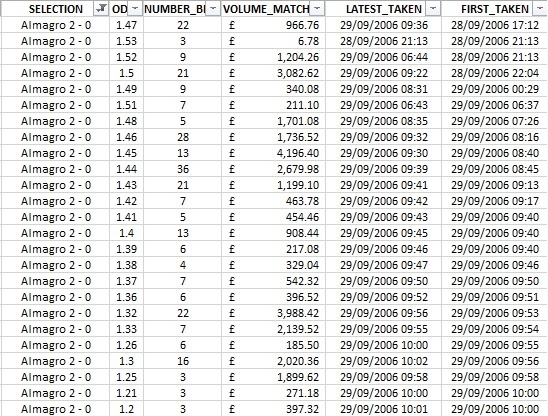 In this article, I have looked at seven matches, using a combination of the Betfair data and the leaked documents provided by Buzzfeed. In each of the matches, it might almost be possible to write each one off as simply an unusual market. Certainly without the information that has come from the 2008 investigation, this would be much easier. However, the presence of many of the same players and the involvement of many of the same accounts, all based in either Northern Italy or Sicily makes it far more difficult to believe that this is simply one big series of coincidences. It shows the value of a proper and thorough investigation - the form that the TIU should be carrying out. In fact, there was not a single investigation into any of these matches opened by the newly-formed TIU, despite being provided with five folders worth of paper documentation and full electronic reports on at least six of these matches as well as at least 21 other matches. Ultimately, maybe there would not have been enough evidence to conclude that these matches were fixed. My personal opinion is that there appears to be ample evidence to suggest that there is something very suspicious going on with these matches. The author of the report himself said that "it was really as strong as any evidence we've had." However, the fact that not one of these matches was even investigated is frankly ridiculous and suggests major problems with the TIU. Maybe the TIU got paid wettquotens in the fix. I'm a bit confused because it sounds like in several of these matches they were holding back on the odds on the player the expected to win. When Arguello went down against Hernandez or Gonzalez, surely they would have made more money if the odds on Arguello had risen higher? So why didn't they? What was the mechanism at work, there? Sorry if this is an obvious question, but I'm not a gambler so this stuff is new to me. odds change based on the money which is put on the market. if much money goes to a player, his odds will decrease (raising his implied probability of winning). normally, you will bet on players who are in a leading position. hence, the odds of players in a leading position will decrease (raising his implied probability of winning (because he is in the lead)).